Ryan Lochte, 11-time Olympic swimming medalist gave up junk food while training for the Games. Good for him! I’d say though, he should have considered treating himself but eating smarter. Ha ha ha! 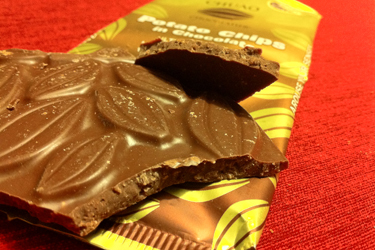 When I saw this potato chip chocolate bar during our trip to Chicago last year, I thought it sounded like a match made in heaven. You get your chips and your chocolate in one treat! I bought one for my brother as a stocking stuffer for Christmas, but I never got to taste it. This year, I saw it again at a grocery store (I think it was Mollie Stones) and had to grab one for myself. 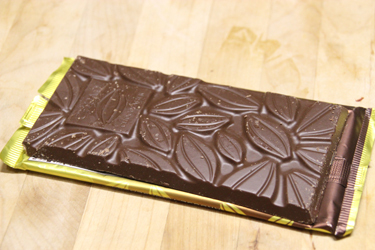 The bar has a lovely rich, chocolatey scent, and the pattern on the top is pretty – cacao pods! 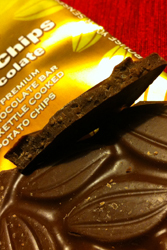 I broke a bit off to see if I could see potato chip pieces in the chocolate. Yum! This looked good! Then, we tasted. I liked the salt in the chips, and they definitely added a nice little crispy crunch. I had a hard time tasting the actual “potato chip” in there, as opposed to just a saltiness – but Nick said he definitely tasted the potato chips. I appreciate that they used milk chocolate, as I think dark might be too overpowering for the somewhat light flavor of the chips. 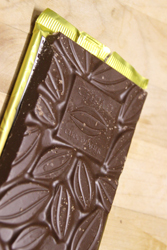 All in all, this is a tasty and fun bar. 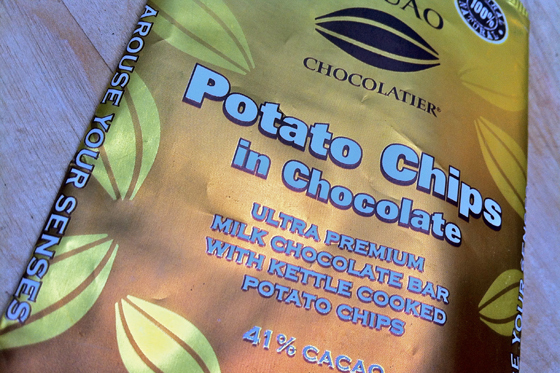 If you know a chocoholic or potato chip lover, or if you want an interesting treat, pick one of these up! Hilariously enough, after I got my own bar (since bringing one all the way across the country from our Chicago trip for my brother), I saw on the packaging that these are made in San Diego! Ah well, I know I can get them now for decent shipping! Did it taste a little like a Twix bar?